Despite pledges by Apple to improve labor conditions at its suppliers, a Pegatron factory in Shanghai is still paying low wages, allowing excessive amounts of overtime, and housing workers in poor conditions, according to China Labor Watch. Before any overtime pay, workers at the factory make just $1.85 an hour, or $318 per month, the labor rights group said in a report issued on Thursday. Even with overtime, wages are typically said to come out to about $753 per month. The factory in fact forces people to put in at least 20 hours of overtime per week. A trainer told CLW's undercover investigator that the standard Western work week —eight hours a day, five days a week —"does not conform to our hiring requirements." Apple's official supplier guidelines require that people put in no more than 60 hours per week. Collecting paystubs from 76 workers in September, however, CLW found only 42 percent had worked 60 hours a week or less. 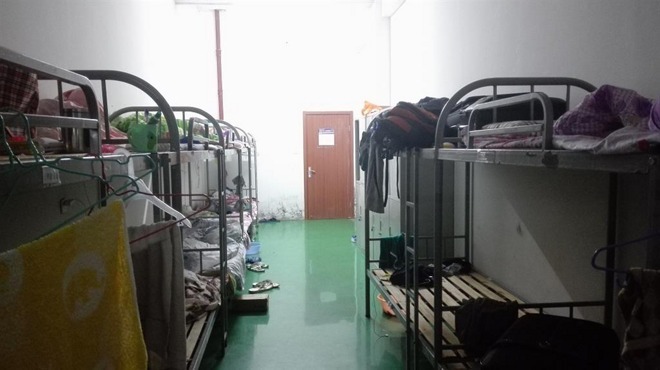 Conditions at the factory are meanwhile said to be dangerous, with no identifiable emergency exits and just 8 hours of safety training, below the Chinese legal requirement of 24 hours. Workers are encouraged to copy the answers to a safety quiz, and are forced to sign a form certifying that they've received 20 hours of training, even putting the trainer's name on the document. Apple is said to be given these falsified forms during audits. Employees are warned about dangerous chemicals used during the manufacturing of products like iPhones and iPads, such as arsenic and mercury, but not told how they're used or how to safeguard against them. CLW identifed a wide number of other problems as well, including dorms housing up to 14 people per room, contaminated by mold and bedbugs. Some things have nevertheless improved somewhat since a 2013 investigation, including changes to sick leave and resignation policies. The factory also appears to have stopped discriminating against Tibetans and Uyghurs, dyed hair, or people over the age of 35.